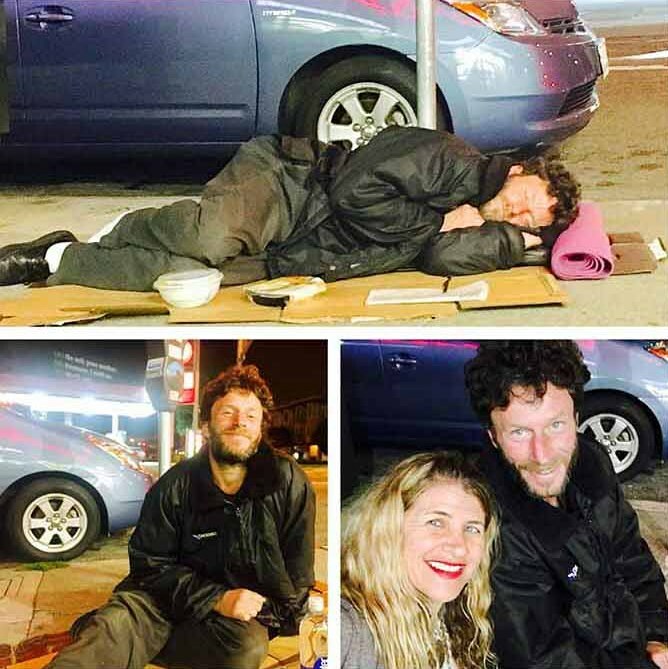 She Tried To Help This Poor Man Anonymously By Leaving Her Food. But What Followed Is Something She Never Forgot. “This morning at 3 am, I befriended a homeless man named Gene. I was in the city heading home and stopped at Walgreens to pick up contact solution. Gene was sleeping on cardboard next to where I parked. As I walked by him to go inside, I froze in my tracks. He had been doing the same crossword I had attempted earlier in the day. When I saw this, it hit me. This could easily be me. It could be any one of us. And I felt compelled to do something to help. As I looked down, I noticed he was using one of his shoes as a pillow. I went to my car, fetched my yoga mat, and placed it underneath his head so he would have a more comfortable headrest. He didn’t stir. I walked into Walgreens, and in addition to getting my contact solution, I bought him orange juice and a sandwich. As I was placing the snacks on his cardboard, he woke up and looked at me with the kindest eyes and welcoming smile. He thanked me, propped himself up, and we ended up chatting for quite awhile. He was telling me about his life, and how he had basically lost everything 6 months before when his company laid him off, and he couldn’t find work. Yet, he was hopeful. He had a job interview this upcoming week and was hoping to get back on his feet sooner than later. I cannot imagine all the hardships he has experienced during this time of homelessness. Yet, what impressed me the most was that he did not seem bitter or angry. He had a twinkle in his eye and was very upbeat and optimistic about his future. Before leaving him, I asked him if there was anything else I could get him at Walgreens. And he thought about it, and asked if I would buy him socks?? I was happy to do so. When I walked out of the store with a 6-pack of crew socks, his eyes lit up, and he was so appreciative. He handed me back my yoga mat and said the socks would provide the perfect pillow for him the rest of the night, and a fresh start for his feet in the morning. And he thanked me for the gift. And it struck me as I drove away, that it was he who gave me the gift. That small acts of kindness can make big impacts not only on the recipient but on the giver. During the time I shared with Gene, I was also reminded that the more we can empathize and see ourselves in other people’s shoes, and see the common humanity in one another, the more we can support and lift each other up. This morning at 3 am, I befriended a homeless man named Gene. I was in the city heading home and stopped at Walgreens to pick up contact solution. Gene was sleeping on cardboard next to where I parked. As I walked by him to go inside, I froze in my tracks. He had been doing the same crossword I had attempted earlier in the day.